Pinterest is one of my new favorite places to find fun recipes. I found my favorite heirloom tomato soup there and now these pumpkin poppers! Pinterest rocks! When I saw the photo of these muffins, I just had to make them. They reminded me of my sugar-crusted popovers, and I knew if they tasted anything like those, then they would be a winner. I have made these 3 times so far and they are gone, like gone, in a heartbeat. The muffins are unbelievably moist and when you cover them all over with the sugar and cinnamon mixture, you have yourself a killer snack. They’re crunchy on the outside and moist on the inside. We’ve been eating them for breakfast, after school with some warm chai tea and even after dinner for dessert. They are so versatile! I’ve made these in a regular muffin tin as well as a mini muffin tin. I wanted to see if there was any difference in taste between the two sizes, and let me tell you, there is not. Both sizes taste amazing. I mean, really, anything covered in sugar and cinnamon is going to taste amazing. I do think the regular muffins hold up better on day 2 though. 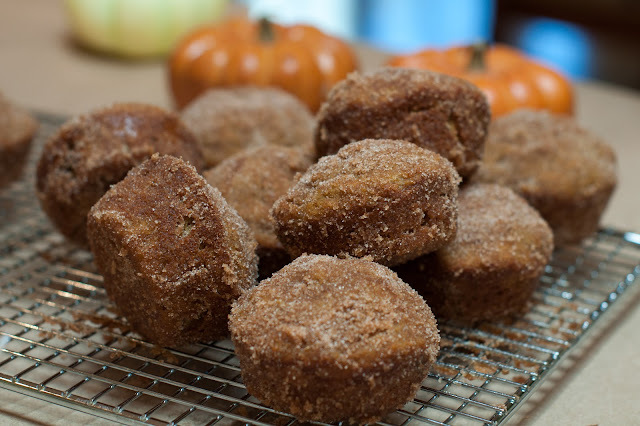 These muffins are best enjoyed day one, as the cinnamon sugar topping is crunchy and light. Day two they are fine, but the cinnamon sugar topping tends to melt into the muffin and they can be a bit gooey. I honestly recommend making the regular sized variety if you’re just making them for your family, so they’re not sitting out for days. Twelve muffins are easier to digest than 24, am I right? The mini muffins are perfect for any of your kids’ class celebrations, as they make 24 muffins. I would make them the day of the party though, just being honest here. People always get confused with what pumpkin puree is. Here’s what I use. 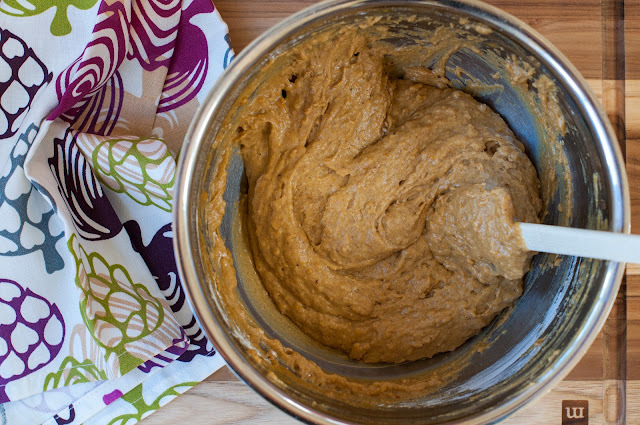 It’s not pumpkin pie filling, its just pumpkin. What I love about this brand is that the can has a BPA free liner! 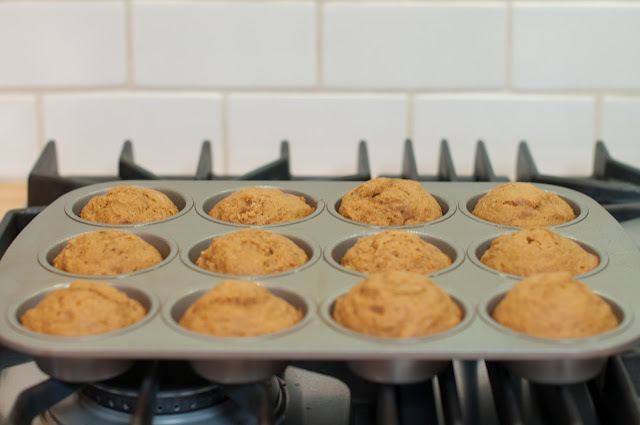 Preheat oven to 350 degrees and spray a regular muffin or mini muffin pan with cooking spray. Add the dry ingredients to the wet and mix with a spatula or spoon until just combined. Do not overmix! For mini muffin tins (24 count) use a small cookie or ice cream scoop. I used a 1 3/4-inch scoop. Make sure you have a level scoop, not a heaping scoop, and fill the tins until almost full. There will be enough batter to do this, it may not look like there is, but there will be. 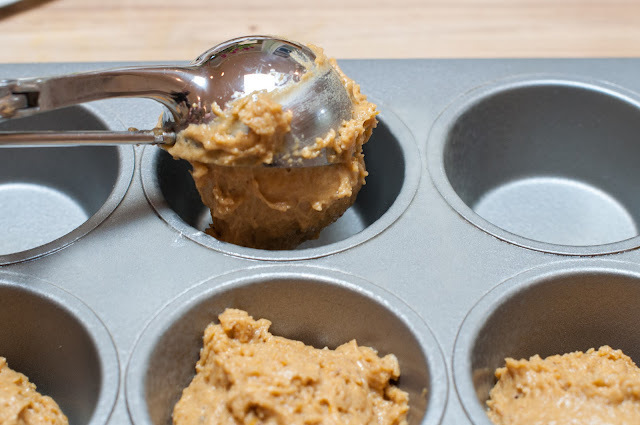 For a regular sized muffin pan (12 count) use a 2-inch ice cream scoop or cookie scoop to fill the tins. You can make it a heaping scoop. 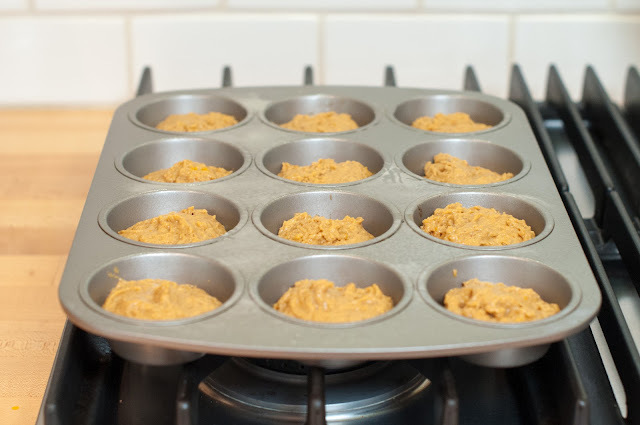 Note: The mini muffin tins will be filled to the top with the batter and the regular muffin tins will not be filled to the top. Bake 10-12 minutes for the mini muffins. Bake 18-20 minutes for the regular sized muffins. To do the finger test, press your finger down gently in the middle of the muffin, if it’s done, it should puff back up automatically on it own. If it stays dented, then the muffins are not ready to come out yet. Here’s what the mini muffins look when they are finished baking. Here’s what the regular muffins look like. The min muffins tend to rise higher because they are filled to the top. Let the muffins cool in the pan on a wire rack for a few minutes, then turn the muffins out onto the rack to cool for a few more minutes. Below are a picture of the regular muffins. They look great out of the muffin tins. 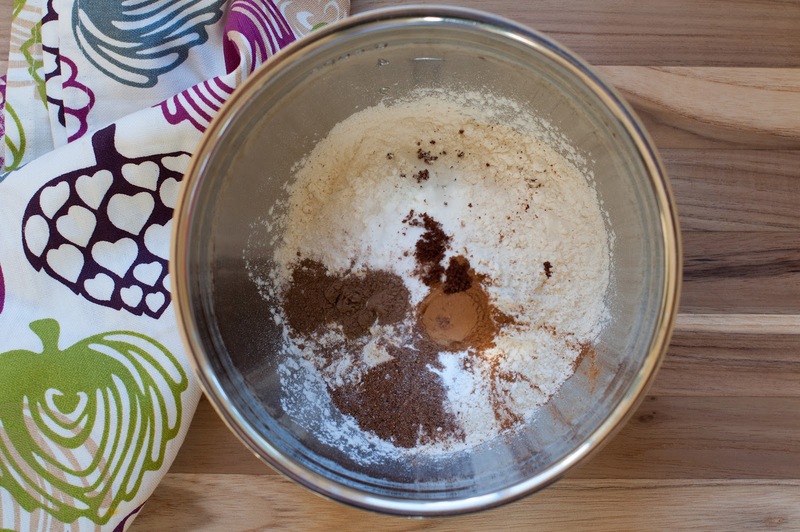 Either while your muffins are baking or cooling, melt your butter in a microwavable safe bowl and whisk together the sugar and cinnamon in a shallow bowl. Once the butter is melted, you can start the buttering process. 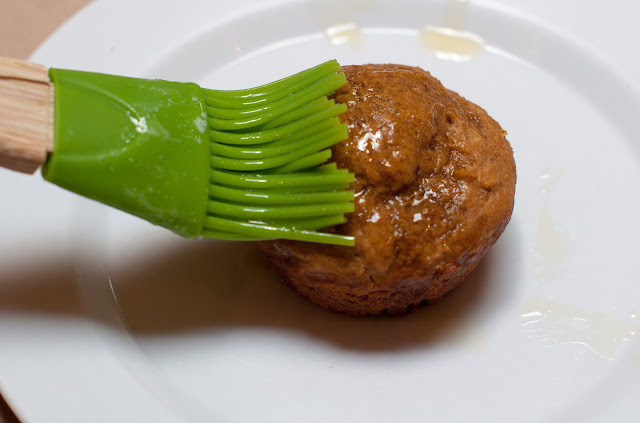 Just grab a muffin and brush it all over with the butter. Next, roll your buttered muffin around in the sugar and cinnamon mixture, making sure to get in all those nooks and crannies. This is where the kids can have fun helping out. 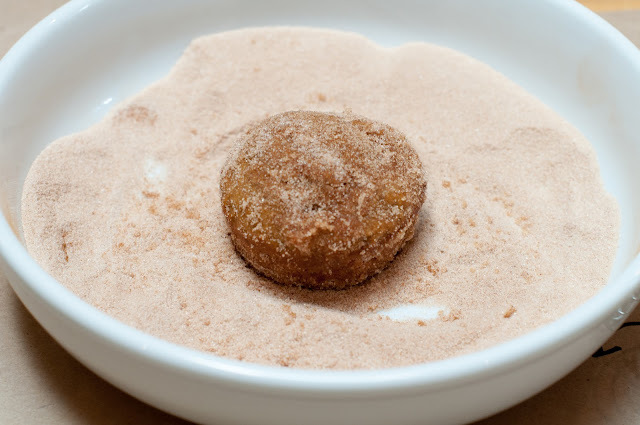 You have to sample one when they’re warm right after they’re rolled in the cinnamon sugar. They’re so amazing that you will really have a hard time eating just one. I’m making the mini version of these for Eli’s class birthday celebration. They’re way easier than cupcakes, and the perfect size for a group of 2nd graders. Let the muffins cool completely before covering, as the sugar and cinnamon will melt into the muffin and get gooey. As a reminder, these muffins are best served day one, as the topping is crunchy and light. Fortunately, these muffins did not last past breakfast on day 2.
makes 12 regular sized muffins or 24 mini muffins. These muffins are crunchy on the outside and moist on the inside. These muffins are best consumed day 1. 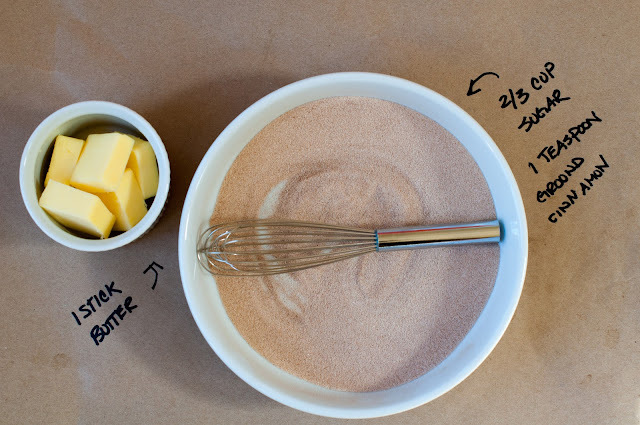 In a medium bowl whisk the following ingredients together until combined; 1¾ cups all-purpose flour, 2 teaspoons baking powder, ½ teaspoon baking soda, ½ teaspoon salt, ½ teaspoon cinnamon, ½ teaspoon nutmeg, ½ teaspoon allspice, ⅛ teaspoon ground cloves. 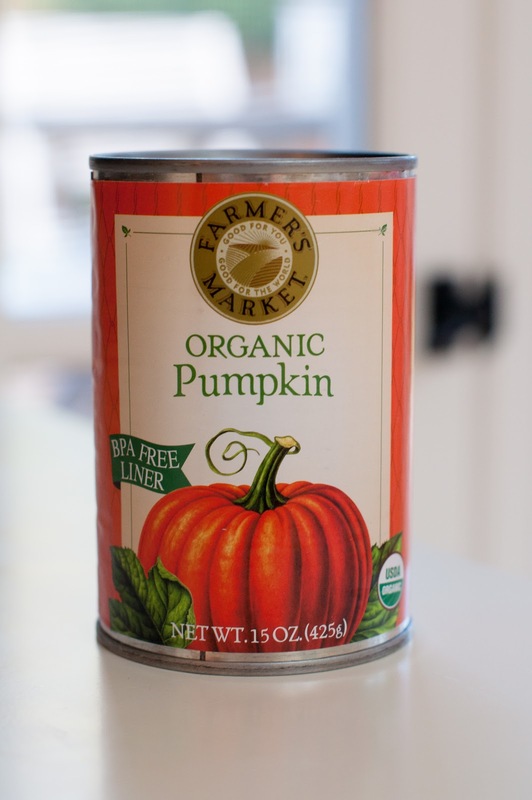 In a larger bowl whisk together the following ingredients until combined; ⅓ cup vegetable oil, ½ cup dark brown sugar, 1 egg, 1 teaspoon vanilla extract, ¾ cup pumpkin puree, ½ cup low-fat milk. 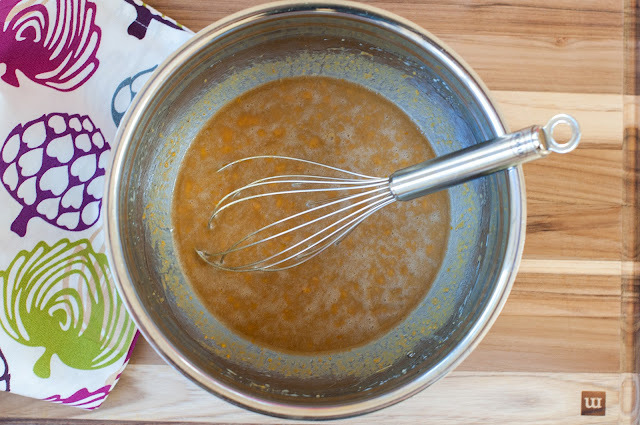 Add the dry ingredients to the wet and mix with a spatula or spoon until just combined. Do not overmix! For mini muffin tins (24 count) use a small cookie or ice cream scoop. I used a 1¾-inch scoop. Make sure you have a level scoop, not a heaping scoop, and fill the tins until almost full. There will be enough batter to do this, it may not look like there is, but there will be. 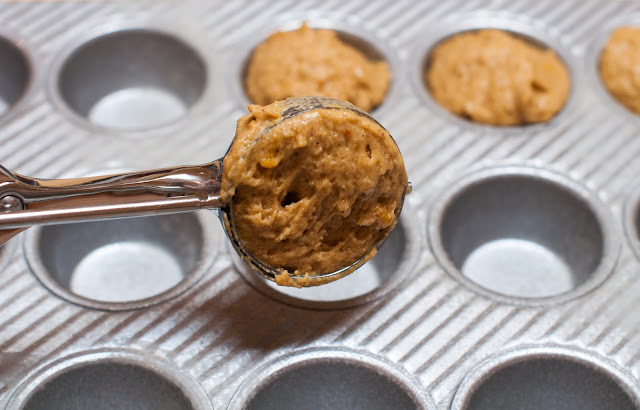 For a regular sized muffin pan (12 count) use a 2-inch ice cream scoop or cookie scoop to fill the tins. You can make it a heaping scoop. Note: The mini muffin tins will be filled to the top with the batter and the regular muffin tins will not be filled to the top. To do the finger test, press your finger down gently in the middle of the muffin, if it's done, it should puff back up automatically on it own. If it stays dented, then the muffins are not ready to come out yet. Let the muffins cool in the pan on a wire rack for a few minutes, then turn the muffins out onto the rack to cool for a few more minutes. Either while your muffins are baking or cooling, melt your butter in a microwavable safe bowl and whisk together the sugar and cinnamon in a shallow bowl. Once the butter is melted, you can start the buttering process. Just grab a muffin and brush it all over with the butter. Next, roll your buttered muffin around in the sugar and cinnamon mixture, making sure to get in all those nooks and crannies. Let the muffins cool completely before covering, as the sugar and cinnamon will melt into the muffin and get gooey. As a reminder, these muffins are best served day one, as the topping is crunchy and light. YUM!!!! Made these this morning during our first rain of the season — it’s very Fall around here. EIGHT THUMBS UP from our family!! I loved how the muffins weren’t very sweet, and then the sugar coating complimented it so nicely. My daughter loved how moist and light they were on the inside. After she finished hers, she exclaimed, “Mom, this is what I want to bring to school for my birthday treat.” Her birthday is in April, ha! (And no, she didn’t see your blog and know you did the same — I kept things very secret while I was baking!) I’m two for two on recipes from your blog. I’m anxious to try some of your dinners soon! THANK YOU! Hi Kyla! Yaay! I’m so glad you made these and that they were a hit! They’re so darn good that I’m actually craving one right now. I thought I overdosed on them last week, but apparently not. Sadly, I did not end up making these for Eli’s class party. They were celebrating shortly after drop off and I didn’t have enough time to whip them up before school. They are best day one as you probably noticed, so I wanted to serve them up fresh. 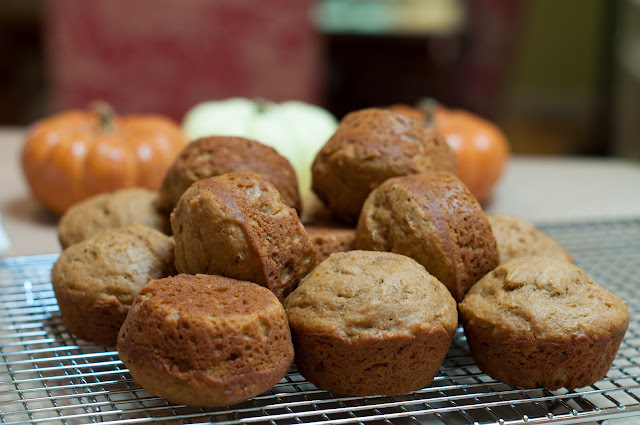 I baked up a batch of regular pumpkin chocolate chip muffins the day before and the kids loved them. I’m going to make these for Eli’s Halloween party though! I even think I might bake up a quick batch today! Let me know what dinners you end up trying! I HAVE to make these for my kids tomorrow. These looks so good and perfect for the season. Oh wow! 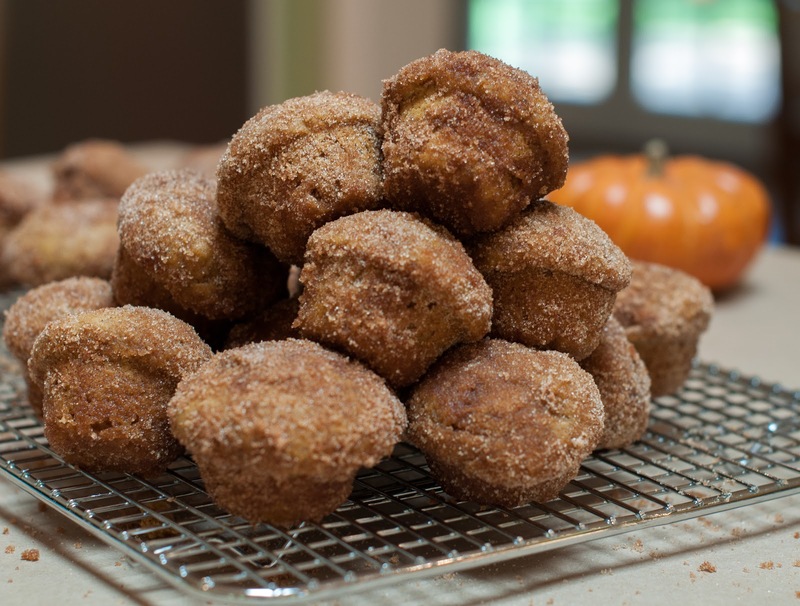 These pumpkin muffin poppers are divine! I made them today as an after school snack and my kids loved them. They were still warm and perfectly moist. They are a new favorite pumpkin treat now. Last night I made your roasted red pepper arugula pizza for dinner (which we had for leftovers tonight on our busy night.) I have heard of people roasting peppers but I never knew how. I was so proud of myself for making this sauce, so thank you for teaching me! I made your strawberry mango smoothie for the family on Saturday morning as we enjoyed a special conference from our church on TV. We are loving Marin Mama over here! Thank you again for sharing these fabulous recipes. I am excited to try more! Hi Jill! Ok, you totally made my day! I love that you made all these recipes and loved them. It makes my heart sing! I’m so proud of you for roasting peppers for the first time. Isn’t it easy? I use to be intimidated by things like that as well, but once you try it, you find it’s not so scary. I love that sauce because it’s honestly, just red peppers, so healthy. I always make the sauce up ahead of time so all I have to do is assemble the pizza come dinner time, and that takes like 5 minutes. Your kids are awesome as well trying all these new recipes. My kids have totally changed this past year since I started this blog. They now eat kale, random veggies, spicy foods, soups galore, you name it. It’s been a culinary adventure for them. OK, please keep in touch and let me know what you’re making, and if you have any tips or suggestions on what you would like to see more of or see in general. I love hearing people’s suggestions and comments. I think blogging should be about community and interacting, just like you would in a real kitchen and neighborhood! Have a wonderful day Jill! They look crazy good! I have seen many muffin recipes like this and they all start out with 1 3/4 c flour. 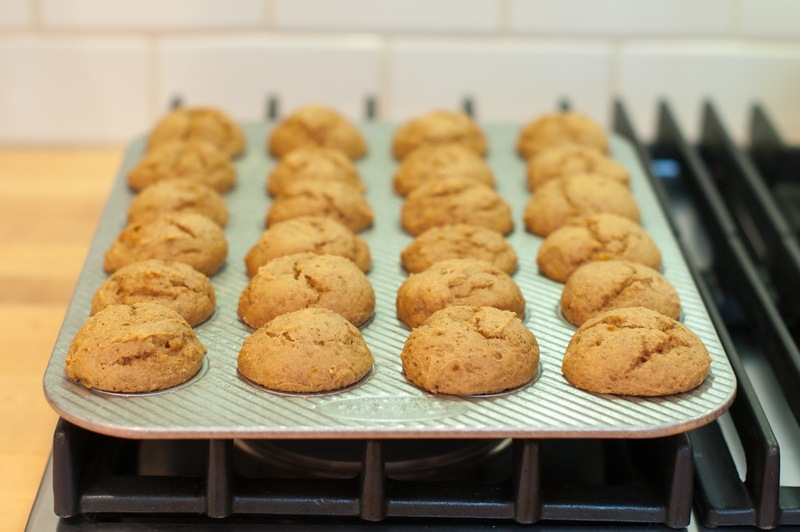 Then the amt of baking soda and powder and melted butter or oil changes slightly, and have seen 1 egg and 1 egg + yolk, and most use 3/4 c pumpkin, 1/2 c milk… and every time I ‘decide’ on a recipe to make, I see another one that looks even better…like yours now!! PERFECTION!! I want these! Thanks Averie. I know, the recipes all change a bit from one another, but I did see the comments on these muffins and they all agreed that 1/2 tsp of baking soda was needed. I am so wanting those pumpkin whoopee pies you made up yesterday. Also tried the red pepper arugula pizza and its AMAZING!!!!!! Hey Amanda! Thanks for the pizza shout out as well at the pumpkin popper one. I love the new photo of Chowder by your name. He is too cute!